Before we jump in: This article was originally shared with my email community in October 2017. I'm sharing it with you on the blog today in the hope that it may be of some encouragement and insight to you in your creative journey right now, and also give you a little sneak peak of what you can expect from Weekly Letters too. If you'd like to receive letters like this one straight to your inbox every Sunday, you can sign up below. You'll also have access to over 100 past Weekly Letters too! "I know making things happen takes time, but I'm just feeling so impatient right now"
Hands up if you've ever felt frustrated, disheartened, and impatient in your pursuit of your creative goals along the way? Don't worry, you are not alone - I have this conversation over and over again with my awesome clients. They take brave, intentional, and purposeful steps forward in their business - maybe they're pivoting their business model to work better for them, maybe they're trying to take their business from a side hustle to full time, or maybe they're building a brand new big-hearted business for themselves from scratch - but now and again they may find themselves feeling wildly impatient and frustrated that their business and their life isn't where they want it to be yet. And it's oh so understandable. Bridging the gap between where we are and where we want to be in our creative work and life can feel like we're taking a huge leap into the unknown - there are never any guarantees that we will succeed, we have no idea what opportunities and obstacles may come our way, and we almost always want to be ten steps ahead of where we actually are right now. An awesome, fulfilling, and sustainable creative business and life is oh so possible for you, but it's not always going to happen on your schedule. Just because you want to quit your job/book an amount of clients/make an amount of money/have that many readers or listeners by a certain date and time doesn't mean it's going to happen by then. None of us are entitled to reaching our goals and our dreams in the way and in the timeframe that we want to. And impatience, if we allow ourselves to live there for too long, will always kill our creativity, our business, and our joy. Impatience takes us out of flow from our creativity - instead of diving deep into the awesome work we're aching to bring to life, we waste time feeling frustrated and disheartened that things aren't happening in the way we want them to. Impatience is never where our best business decisions come from - instead of taking savvy, intentional, and purposeful action in our business, we can be distracted by pursuing instant gratification that isn't aligned with our core values and goals. 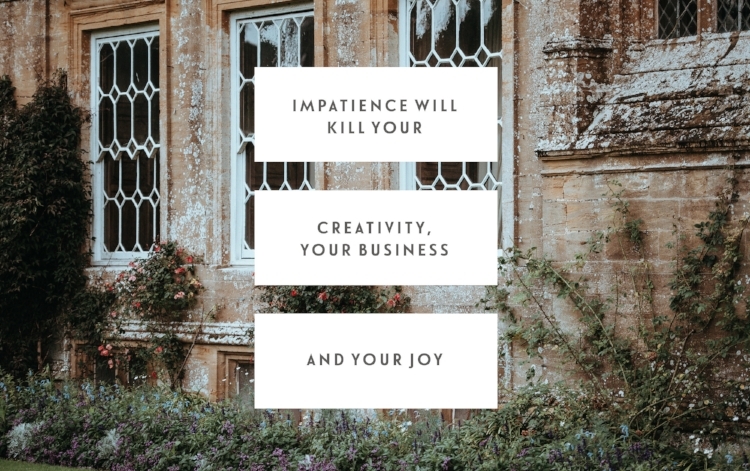 And impatience can leave us feeling angry, frustrated, and disconnected from ourselves and our work - instead of feeling devoted to our craft, committed to our business journey, and energised for the work ahead to come, we can feel disengaged and disappointed that we haven't made things happen yet. I know that all of this is easier said than done - building a business and pursuing a creative life isn't easy. It's human nature to feel impatient and frustrated that we aren't where we want to be yet. You're allowed to feel those feelings - but my encouragement for you today is to not sit with those feelings for too long. You are capable of crazy-awesome things. Your dreams, goals, and vision for your creative life are valid and oh so possible. But it's not always going to happen on your schedule. It may take longer than you first hoped it would, it may be harder to get there than you first prepared for, and it may look wildly different than what you first expected it to look like too. But you can bridge that gap, you can build for yourself a creative life that is impactful, fulfilling, and sustainable, you just need to be bigger than your impatience. You have to keep going even when you feel frustrated, disheartened, and disappointed that you're not there yet. You can turn that frustration into productive energy if you choose too. You have to let go of the timeframes and expectations that you started with and open yourself up to the reality that is right in front of you. Anyone who tells you that you can build a profitable, thriving, and meaningful creative business overnight is lying. There are no shortcuts or step-by-step blueprints that can bridge this gap for you. This is part of the journey. If you're taking intentional, focused, and purposeful action in your business, you are always moving forward - even if you can't see it yet. My biggest hope for you is that you keep going. Keep on doing the awesome work that you're doing in the world and don't let your impatience kill your creativity, business, and joy. And if you enjoyed this article? Sign up below to receive letters just like this one straight to your inbox every Sunday.